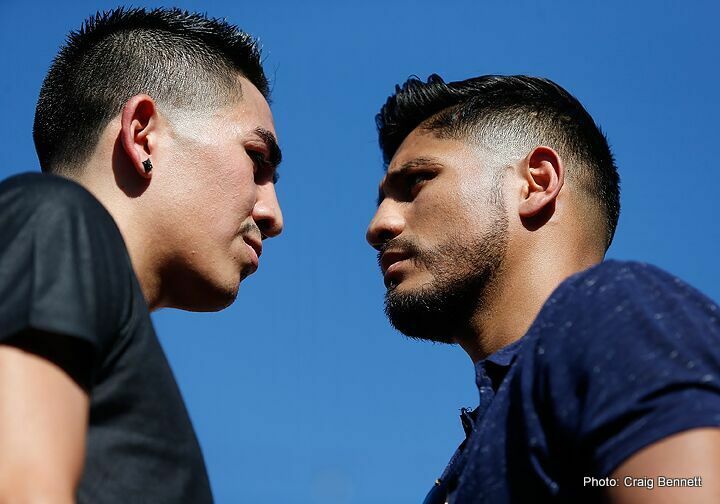 By Dan Ambrose: This Saturday night on August 29th, former three division world champion Abner Mares (29-1-1, 15 KOs) will be facing former two division champion Leo Santa Cruz (30-0-1, 17 KOs) in a 12 round fight on Premier Boxing Champions on ESPN from the Staples Center in Los Angeles, California. The Mares vs. Santa Cruz fight is a good one, but it’s one that would have been much better had the fight taken place in 2013 when the two of them were still being matched against quality opposition. Mares has been on the rebuilding mode with his career ever since he was knocked out in one round by Jhonny Gonzalez in August 2013. Mares has fought three times since then against weak opposition in beating Jonathan Oquendo, Jose Ramirez and Arturo Santos Reyes. Santa Cruz stopped fighting top level opposition in December 2013, when he struggled to defeat Cesar Seda. Since then, Santa Cruz had beaten four soft opponents in Cristian Mijares, Manuel Roman, Jesus Ruiz and Jose Cayetano. It would have been nice if Mares had started facing good opposition again before the Santa Cruz fight because it would have made the fight more interesting to the boxing fans. As good as the fight is there hasn’t been much excitement generated about the match-up largely due to the two fighters having failed to face quality opposition for the last two years. Santa Cruz annoyed some boxing fans by him talking up a fight against unbeaten super bantamweight champion Guillermo Rigondeaux, but then failing to fight him. Instead of fighting the unbeaten Cuban in his last two fights, Santa Cruz has faced Ruiz and Cayetano. Neither of those guys are anywhere close to the talent level of Rigondeaux. Santa Cruz would have been better off keeping quiet about Rigondeaux because it looked bad when he talked up a fight against him and then faced two weak opponents in record-padding fights. Mares, 29, doesn’t look as good as he was four years ago when he was beating fighters like Joseph Agbeko. Mares looks older now, and less willing to exchange than he was back them. He now tries to get out of the way of shots and win by out-boxing his opposition rather than mixing it up with them like he did in the past. We could eventually see the winner of the Mares vs. Santa Cruz fight the likes of IBF super bantamweight champion Carl Frampton in the future. If that happens, it’ll be a good thing. But if the winner of the Mares-Santa Cruz goes back to fighting weak opposition again, it’ll be disappointing because those two fighters have already thrown away the last two years of their careers fighting weak opponents.